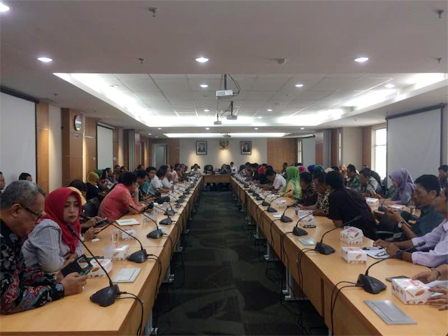 Six legislative councils (DPRD) from Semarang (Central Java), Sungai Klungkung (Bengkulu), Bukit Tinggi (West Sumatera) and Hulu Tengah (South Kalimantan) are conducting work visit to Jakarta DPRD.
" This is actually not study, but sharing. We also had visited to Bali, Semarang, Tegal and so on"
On that occasion, those tend to study about the accountability report (LKPJ) and honorary, locally known as tenaga ahli. Jakarta DPRD Commission B Member, Syarifuddin disclosed the work visit between these councils have been held routinely for sharing ideas. "This is actually not study, but sharing. We also had visited to Bali, Semarang, Tegal and so on," he stated, at Jakarta DPRD building, Thursday (4/13). In that occasion, he also gives input to those councils to see four basic programs in preparing the budget. Four basic programs are RPJMD, RKPD, Musrenbang and recess. "In preparing budget, must be in accordance with such programs. Then the amount is set through a meeting in Budget Committee (Banggar)," he expressed. Related to LKPJ, he asks them to always coordinate with Supreme Audit Agency (BPK). Thus LKPJ discussion could be in accordance with the procedure. "So we'll know what they (BPK) want," he said.